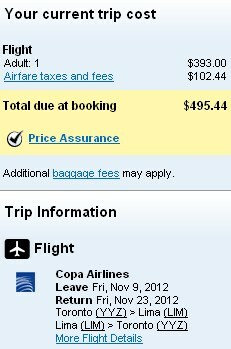 Similar to the deal to Panama last week, COPA Airlines just loaded some pretty crazy fares to Santiago, Chile (SCL). They're priced at $567 roundtrip after taxes, which is about 40% cheaper than their closest competitor. It looks like the affected fares are between September and December. Here are some example searches on Kayak. Click through from Kayak to Orbitz to see the verified price where it can be booked. Another interesting one is Buenos Aires, Argentina (EZE). Go to one of the searches above and substitute Buenos Aires for Santiago, and you'll find prices at $641 roundtrip after taxes, which is about about 30% cheaper than the next cheapest airfares. San Jose, Costa Rica is down to $377. And you can also try Lima, Peru - which is showing fares of just $495 roundtrip after taxes, around 27% cheaper than the next cheapest airfares. toronto, yyz, flight deals, costa rica, central america, san jose, sjo, copa airlines, buenos aires, argentina, eze, south america, santiago, chile, scl, lima, peru and lim.